Although, we traditionally measure earthquakes by the Richter Scale, it is important to understand the actual mechanics of movement and the active ingredients that cause the earthquake damage during tri-axle actions. The Richter Scale, designed by Charles Richter of Southern California, basically measures the energy required to produce the movement within the earth’s crust. Each whole number equates to 10 times the energy of the number below. Therefore, a magnitude 6 earthquake requires 10 times the energy of a magnitude 5 earthquake, or a 9.0 earthquake requires 32 million times the energy necessary to trigger a 4.0 quake. A = maximum zero to peak amplitude of seismic wave (mm) recorded. A0 = Empirical function derived from the distance from seismometer station to the epicenter of the earthquake . However, when we look for threats to our structural safety, we look at (PGA) Peak Ground Acceleration. PGA is measured in G-Force or gravitational force. Here, we look at the speed of the shift caused by the earthquake and more importantly, the momentum produced by the movement and the required force necessary to put on the breaks. In a standard brick and block structure, the reinforcement of steel bars is used to resist the momentum. With a wall that is that heavy, the momentum produced is extremely large; therefore, the cost of steel rises proportionally. With block and cement, the use of raw force and the rigidity of the structure allows for the strength of the building. In sharp contrast , the flexibility of the SIPS structure combined with the lighter weight EPS (expanded polystyrene) core enables absorption and resiliency of movement without measurable damage. In the Mexico City earthquake of September 1985 when somewhere between 10,000 and 40,000 people were killed and the event caused 412 buildings to collapse and another 3,124 were seriously damaged in the city. Much of that damage would be considered related structural collapse which includes town homes and condominiums. To put this in perspective, SIPS have been tested to withstand a G-force greater than 7 without effecting the structural integrity of the building. This large an earthquake with a G-force greater than 7 has yet to be recorded. The Mexico earthquake has been used to develop computer models for risk analysis of differing construction methods. By many experts, SIPS are considered the most effective safe house for the money. 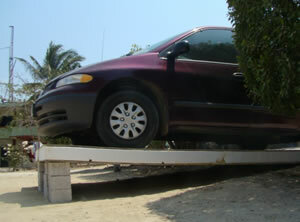 Photo of a SIP panel with a car testing the panels strength. 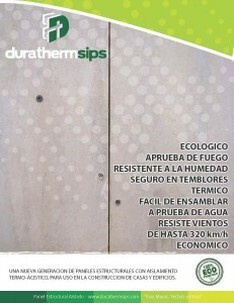 Duratherm Building Systems MexicoWe are a new generation of Structural Thermal-Acoustic Insulated Panels for use in housing and commercial construction. In our Mexican fabrication plant, we manufacture SIP Panels of the highest quality to allow our customers local & international the best return on their investment while making sure they enjoy a safe and comfortable energy efficient building for years to come. New times demand new products. We offer product options that make the most efficient use of our natural resources. Lets care for our environment. Committed to good stewardship of our planet.